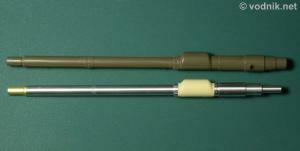 Model Point produce a wide range of machined aluminum gun barrels for 1/35 scale armor models and among those products is several variations of RH120 gun barrels. Rheinmetall 120 mm smoothbore gun is used in several modern main battle tanks, among them all types of German Leopard 2 tanks and their derivatives, like Swedish Stridsvagn 122, and also American M1A1 and M1A2 Abrams tanks. Most of those tanks use L44 type barrels (length = 44 calibers), but Leopard 2A6 and 2A6EX tanks have longer L55 barrels installed. These provide higher initial projectile speed and thus higher accuracy at longer range and more armor penetration power. 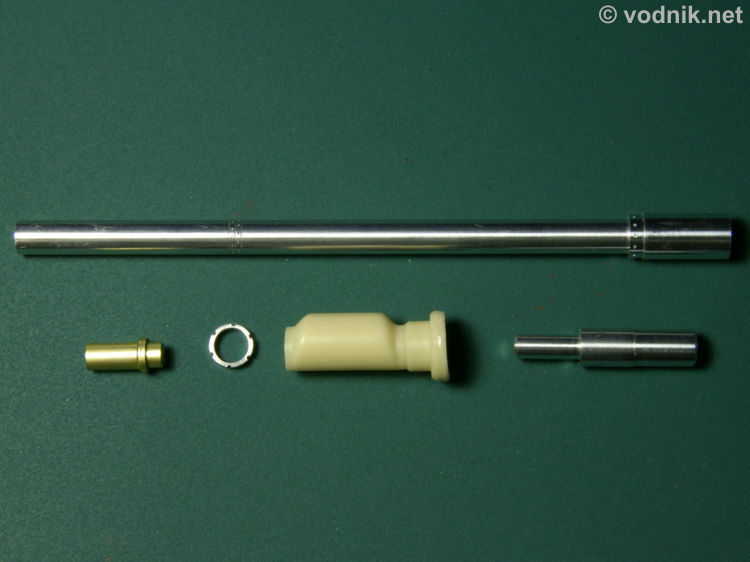 Model Point offer both L44 barrels and L55 barrels in several sets designed to fit to various models: Italeri Leopard 2 (L44) and Leopard 2A5 (L44 and L55), Tamiya Leopard 2A5 (L44 and L55) and M1A1 Abrams (L44). In the set we get three machined aluminum parts, one brass part and a resin piece. Aluminum parts are main barrel, mounting cylinder and fume extractor holding ring. Gun muzzle is provided as machined brass part and fume extractor is cast in resin. No instructions are provided, so modelers must find the right way to install the gun themselves. It is actually quite easy, but part of kit barrel has to be cut or sawed off. To find the right place to make the cut one needs to match the aluminum part to the plastic part and cut off the rear section of kit part in place where metal barrel ends. Once you properly separate rear part of the kit barrel, enclose the short aluminum cylinder inside it - the rest of the metal barrel just slides on one end of this cylinder. To install fume extractor the resin part has to be separated carefully from the casting block, but it is simple if you use fresh No.11 blade. Then the extractor slides onto a barrel and aluminum ring should be glued to one end of it. 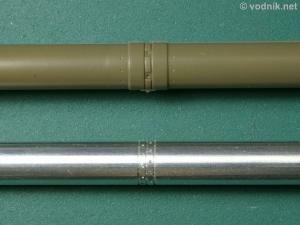 Brass muzzle has a short shaft on one end, which slips into a hole at the end of the aluminum barrel. 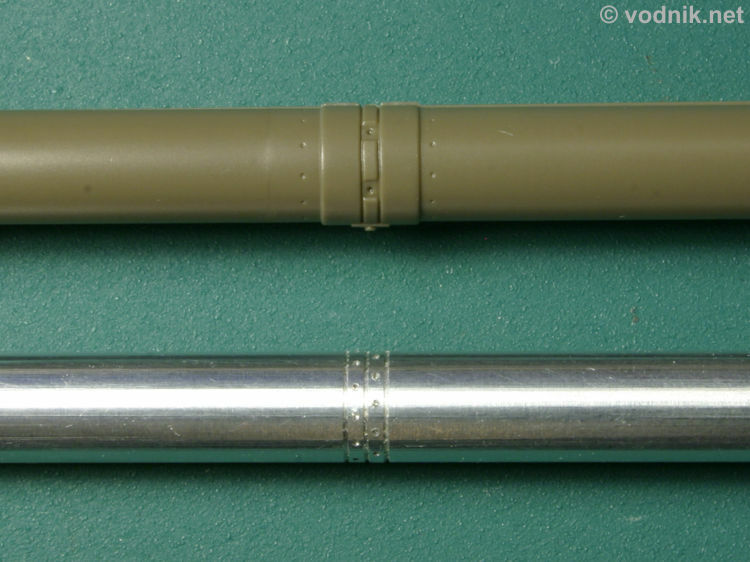 There is a small flat surface on the muzzle to which the muzzle reference sensor, removed from kit part B-55, should be attached. 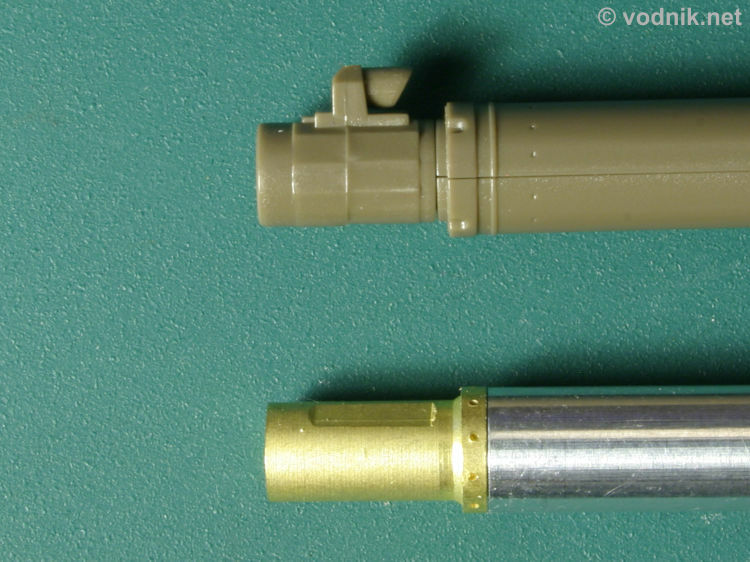 Comparison of barrel from Tamiya Leopard 2A6 kit and assembled Model Point barrel. The length of the Model Point barrel is almost identical to the kit barrel, so I assume it is accurate. Also lengths of all barrel sections are very close. The shape of resin fume extractor is very good, but Tamiya part is also accurate. The surface of resin part is smooth - it is a pity that Model Point didn't give it the proper fiber texture, clearly visible on the real thing. There are some nice details machined on the metal barrel and muzzle surfaces, like engraved lines and rings of tiny holes. The only problem is that these details are not accurate... In the mid way between the muzzle and fume extractor on the real barrel is a collar, which connects two parts of thermal sleeve. Instead of making new long sleeve for their new gun, Rheinmetall used shorter sleeves designed for L44 barrels and simply added extensions to them. In Tamiya kit the details of connecting collar are very accurate - unfortunately in Model Point barrel they are not (see picture). Also the muzzle is not quite accurate. On the real gun muzzle the outer surface of the muzzle is not circular in cross-section on the whole length of the muzzle, but rather it is polygonal (octagonal?). This shape is properly reproduced in Tamiya part, although in my model there is a slight misalignment along the mold seam running around the muzzle. Model Point part, except for the area flattened to accept reference sensor, is cylindrical. I do not see any easy way to add proper shape to this part. 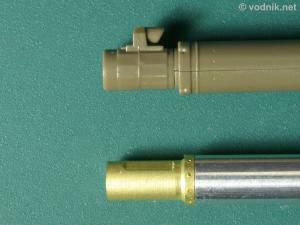 Also details of the end of the thermal sleeve, again well done in Tamiya part, are not properly represented in metal parts. Details of thermal sleeve connecting collar. Click on picture to enlarge it. A close-up of muzzles. 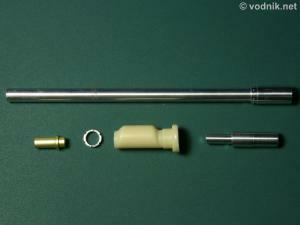 In my opinion Model Point barrel cannot be considered a valuable replacement for the parts included in Tamiya Leopard 2A6 model. Of course proper assembly of plastic parts means dealing with the long seam along the barrel and it may be difficult for some. Aluminum parts solve this problem. But for me it is not enough to justify the lack of details and inaccuracies of metal parts. I think Model Point product can still be interesting for modelers, who already bought original Leopard 2A5 release of Tamiya kit, but now want to build it as 2A6 variant and are not willing to spend money on the newer Tamiya model. 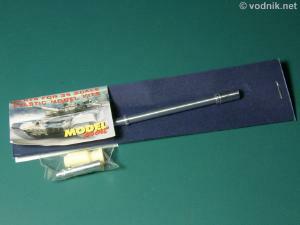 Model Point barrel at $21.95 is not exactly cheap, but it is still less than a half of Tamiya Leopard 2A6 kit price. Of course it is up to individual modeler's decision whether to accept inaccuracies of Model Point product.